Carotid Duplex Ultrasound is an excellent way to test for blockage in your carotid arteries in the neck. Blockage in these arteries accounts for up to 75% of strokes. 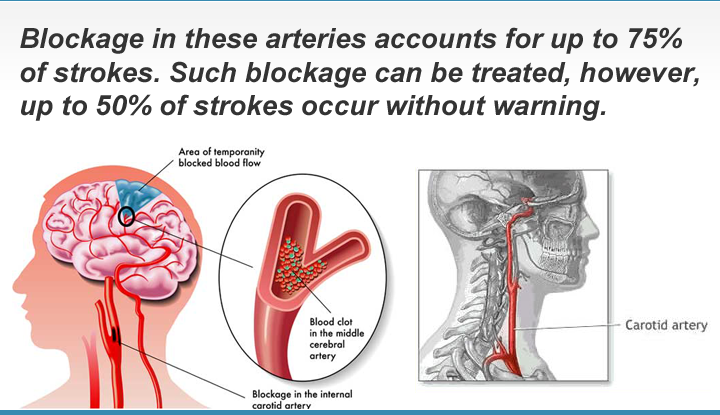 Such blockage can be treated, however, up to 50% of strokes occur without warning. It is hard to know if you have a problem without a screening test. Carotid Artery Screening is simple, painless, noninvasive testing that takes less than ten minutes. We apply acoustic gel to your neck and scan the carotid arteries with sophisticated color flow Doppler Ultrasound. This technology allows us to clearly see these arteries to determine the presence of any dangerous plaque buildup, which can block blood flow to the brain. If there are dangerous blockages, you will have information to give to your physician for follow-up care. Purpose: The ultrasound duplex color flow imager will allow the registered vascular technologist to visualize the buildup of any fatty plaque in the carotid arteries that could lead to a Stroke. Procedure: The technologist will apply an acoustic gel over both sides of your neck and use the ultrasound transducer to see the inside of the carotid arteries. The technologist will also measure the velocity of the blood flow for determination of the severity of the plaque build up.